The home secretary has condemned the "senseless violence" that has seen a rise in the number of teenagers being fatally stabbed in England and Wales. Sajid Javid was speaking after the murders of a 17-year-old girl in east London and a boy, also aged 17, in Greater Manchester at the weekend. He will meet police chiefs on Wednesday to look at ways to combat violence. Figures show the number of children in England aged 16 and under being stabbed rose by 93% in the five years to 2018. Mr Javid said: "We're taking action on many fronts... It is vital that we unite to stop this senseless violence. "Young people are being murdered across the country, it can't go on." Former Metropolitan Police Commissioner Lord Hogan Howe, said the government should appoint a leader, or tsar, to "get a grip" on the problem, and that person should be in charge of how money is spent - especially on recruitment - not individual forces. "I'd want to know, week after week, when are you recruiting them? When do they they arrive? When do they get trained? And when do they hit the streets?" he told the BBC. "You want to know day-by-day what's going to get delivered. And I don't get that sense of grip." 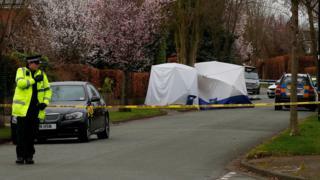 On Saturday evening, Yousef Ghaleb Makki, from Burnage, was stabbed to death in the village of Hale Barns, near Altrincham. Two boys, also aged 17, have been arrested on suspicion of murder and remain in police custody. Yousef's death came a day after Jodie Chesney was killed in a knife attack in an east London park on Friday night. The teenager was stabbed in the back as she played music with five friends in a park, the Metropolitan Police said. Officers say Jodie's attacker was a black male in his late teens but gave no further details. There are no descriptions of a second suspect. Jodie's family branded it a "totally random and unprovoked attack". The killings follow the deaths of three other teenagers in knife attacks in Birmingham in two weeks, prompting West Midlands Police and Crime Commissioner David Jamieson to brand the situation a "national emergency". Meanwhile, figures from an investigation by Channel 4's Dispatches programme suggest the number of children and young people in England and Wales linked to murders and manslaughters using knives has risen by more than 75% over three years. The number of police-recorded offenders aged under 18 rose from 26 to 46 between 2016 and 2018, the programme found after analysing Freedom of Information request responses from 29 out of 43 police forces. NHS data also shows that the number of children aged 16 and under treated for stab wounds in England rose from 180 in 2012-13 to 347 in 2017-18. The Home Office said it set out a range of actions to tackle violent crime in October. They include a £200m youth endowment fund; consultation on a new legal duty to underpin a public health approach to tackling serious violence, and an independent review of drug misuse. It said an extra £970m in police funding is proposed for 2019-20 and added that the offensive weapons bill currently before Parliament will introduce new offences to tackle knife crime and acid attacks. Home Office minister Victoria Atkins told BBC Radio 4's Today programme said a week of national action on knife crime took 9,000 knives from the streets and saw more than 1,000 arrests. She said the #knifefree campaign aimed to make the point "that the overwhelming majority of young people do not carry knives".